This month marks the 10 year anniversary of my work on the web! While the original VCSp was done in spring of 2000, the original GeoCities site itself wasn’t created until the fall. Shortly after, it moved to Classicgaming.com where it stayed until spring of 2004, when I started my own domain “Benheck.com”. I went with that name because it was an available 7 letter dot com – couldn’t pass it up! Little did I realize I was creating my new nickname. Oh well. It’s been a long, interesting journey since then and I’d like to thank everyone who supported me along the way and bought my products. As a fun treat, you can visit a replica of the old site by clicking the image above. This is the oldest working replica of the old site I could find in my archives. Almost all of the old data / stories is on this site as well, just check out the Site Archives link on the lower left to pick a year. Stay tuned next weekend for the reveal of the new XBox 360 Slim laptop (and watch my show to see how we built it). For a personal list of what I felt were my best, worst, most influential and favorite projects of the last decade, continue reading! The N64 was a pain and a half to modify, they break if you look at them cockeyed. The ColecoVision also sucked with its 3 different voltages including -5v for some reason. Ug. If you email me and never hear back, it’s because you’ve asked me to build one of these. While I was well known before building it and even had a book out, it was the Xbox 360 Laptop that garnered me even more fans and acclaim. The original was a complete pain to build, but unlike the N64, worth it. I still continue to build Xbox 360 laptops to this day. Obviously I have to give credit to the original VCSp as well, without it I wouldn’t be here. It’s not the best thing I’ve ever made, but it’s the one I’d most glad I did. 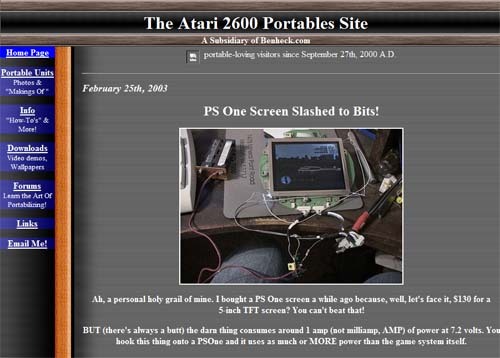 Favorite Project: Either the Commodore 64 or 2009 Atari 800 laptops. The Commodore 64 laptop took forever but when it was finally done it was a beautiful recreation of a 1980’s product that – most importantly – also looks like it came from the 80’s. Today it rests in the Computer History Museum in Mountain View, CA (Silicon Valley) which is quite an honor considering they also have a Difference Engine replica as well as an original PDP-1 with Space War. The 2009 model Atari 800 computer was a favorite for the same reason – it looked authentic, as well as being the computer I grew up with and still have today on my desk. Best Project: Bill Paxton Pinball. It didn’t get me the web traffic of an Xbox 360 laptop, but the custom Bill Paxton machine is far and away the most advanced thing I’ve ever built. It required wood working, art layout, sound design, programming, physics, electronics, embedded processors and mechanical engineering. It is really so far beyond anything else I’ve done before I’m not sure if people even realize it. Anyway, it was a blast to build and you haven’t seen the last of Ben Heck pinball! I’ve had the honor of watching you since 2005, and I’ve seen a lot in that time. Happy 10 year anniversary! I know you’ve been sticking with 17″ gateway monitors since it offers the perfect 720p resolution, but if there was a smaller size monitor with the same resolution, would you consider it? A good example of one I found was the “HP w15v”. I’m not too sure about compatibility, but it seems it would certainly help with the smaller form factors. Might be worth looking into now that consoles are getting smaller form factors and board sizes. Great job Ben…glad I got to see you at Maker Faire! I read through some of those old posts on the ‘classic’ site. Pretty funny. I think The Commodore 64 laptop ist one of your best projects to, it’s ellegant. Lol, Its 7 years from that quote. I wouldn’t pay more that $50 (If THAT) for the very screen he speaks of! XD Man, hows times change so fast. I remember visiting your site religiously back in the day when it first got hosted by CG.. Really miss those days and that old classic website. I just spent about an hour browsing around and can’t get enough. Now onto PoD to reminisce.